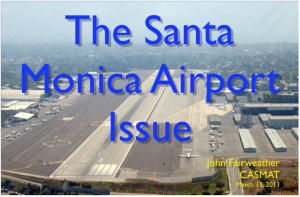 At a recent talk entitled “The Santa Monica Airport Issue” given to a group largely unfamiliar with the details of the SMO situation, I was asked to make my slides available so that they could be checked for accuracy. This post and the video below are the result. You will find links that lead to the backup material necessary to confirm the truth of all statements at the bottom of each slide. Believe it or not this really is the situation that exists at SMO. The City Council is holding a single issue meeting on April 30, 2013 starting at 6:30 PM at City Hall on the subject of the airport and its future. We feel that it is important that all those concerned about SMO’s future are fully informed about the airport’s history and problems, and this video is intended to accomplish that. The video runs for about 25 minutes. We hope to see you all at the April 30 meeting. This may be your last and best chance to make sure your feelings are known. In fact, few other aviation businesses at SMO have such a high percentage of non-aviation sub-tenants as Atlantic Aviation, so the actual potential job gain could be much higher. So if the tower and aviation in general were closed and the existing aviation rents turned over to non-aviation use, it would in fact generate over 3,000 DIRECT jobs. These are DIRECT jobs, not the fictional ‘imputed’ indirect jobs that the HR&A study estimated by taking passenger data from commercial airports like LAX (since such data is not available for GA airports like SMO), and applying the assumption that the same proportion of passengers arriving at a GA airport would be tourists as would be the case for LAX. When questioned, the presenter of the HR&A report admitted this flaw during his public presentation. Of course this assumption is ridiculous, and I’d be amazed if more than a handful of people arrive at SMO as tourists each year. Those indirect jobs are a fiction based on a deeply flawed computer model being fed erroneous assumptions. The truth is that closure of the airport or elimination of aviation businesses would be a major job generator.